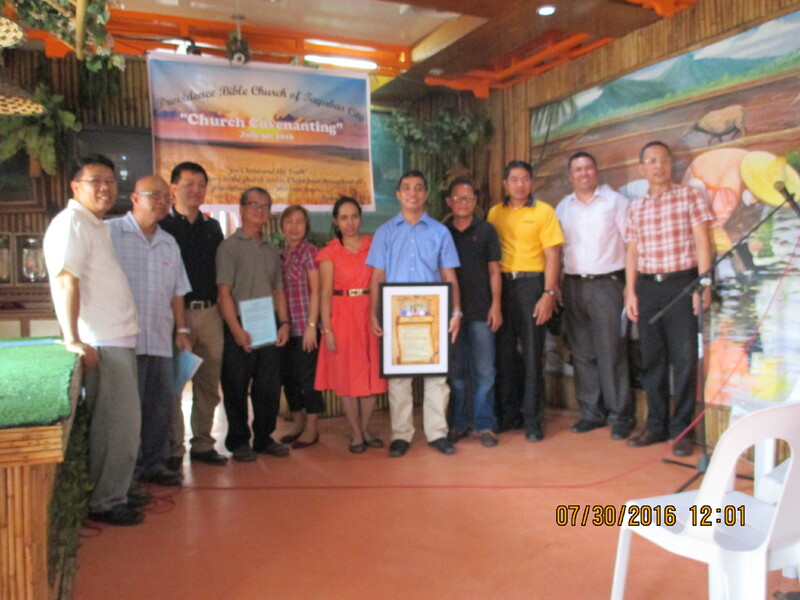 During the covenanting ceremony of Providence Bible Church, held on July 30, 2016, at Rodillas Restaurant, Brother Willy Alcantara gave a graphic account of the history of PBC. It all started in 2008 when Pastor Fidel led a Bible study in Tayabas every Saturday. It was attended by couples Jun Cabalse and Mayette, Benjie and Badeth, Willy Alcantara and Violy. Pastor Fidel taught them reformed teachings about the Sovereignty of God, Sin, heaven and hell and other important teachings. However, in 2014, the Bible study stopped due to Pastor Fidel’s increasing pastoral responsibility. But the group continued their Bible study until by providence Brod Benjie met Pastor Allan and Brod Reymar in Lumban Puritan Reformed Baptist Church in May, 2015 and told them about their need for Bible study leader. Pastor Allan visited the group on July 2015 and he continued what Pastor Fidel had begun, until Brod Reymar, took over. It became a regular fellowship every Saturday afternoon. 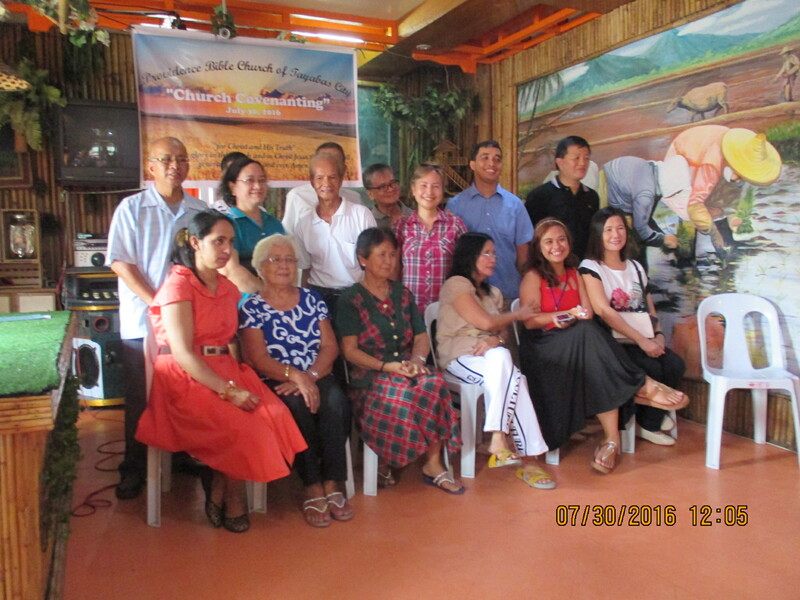 Deacons Arnold and Abe, brothers Archie and Rodel also joined the fellowship. On August 31, 2015 the group decided to name their fellowship, Providence Bible Church. On April 2, 2106, they interviewed Brothers Jun and Willy and Sister Mayette for membership. On May 1, 2016, sister Mayette was baptized in Trinity Baptist Church. Brother Reymar, TBC’s missionary was officially designated as worker in Providence Bible Church. Reymar and Janet’s letters of resignation were read among TBC congregation on July 23, 2016. PBC is a very promising church. Members and prospective members are mostly couples and serious in faith. Male members are likewise trained workers. The harvest is plentiful in Tayabas. With PBC in the heart of Tayabas City, we can expect a plentiful harvest in the years to come.